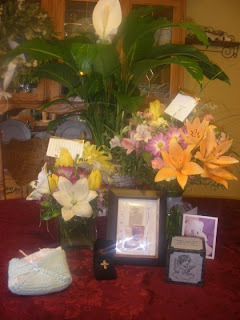 Stillbirth, Miscarriage and Infant loss....Gods Decision. I have had 7 pregnancy losses and the first six were early on and I figured ok we will just try again. It was not until I lost my 7th, Tyler at 16 weeks that it all came flooding in all the losses I had endured and had not grieved for them like I needed to. Having to give birth to Tyler and hold his tiny body in my hands was a turning point for me spiritually (An unborn child is not only a fetus or a “piece of tissue” to God, but is one of His children. Jeremiah 1:5 says that God knows us while we are still in the womb). God now holds my 7 children in his hands and they are waiting in heaven for me. God does work in miraculous ways, after Tyler's death the Doctors felt they needed to run further tests on me since I had so many losses. I guess this was never done before as I had had 6 other live births. Well it turns out I have Factor 5 Leiden a blood clot disorder, which they feel is what contributed to the losses. I now take a baby aspirin a day and am monitored closer when I am pregnant. Some of my sisters have been tested for the disorder and are also positive for the disorder. It's like Tyler is my guardian Angel if it was not for his death I would not have been tested unless I developed symptoms of a clot. While I grieve for my children God has other plans and they will be waiting for me. In September of 2009 I found out I was pregnant with my 7th child, I had all the typical symptoms, morning sickness, fatigue, etc. The pregnancy was going great heard the heartbeat, went in for an ultrasound In December and scene our little baby just growing and right on track and heart beating away the next couple of months passed without any problems, I had feeling something was not right so I called my Dr. and went in to see her she tried to find the babys heartbeat and could not. so I was scheduled for an Ultrasound 2 hours later so I waited finally I was called back as soon as they put the probe on my stomach I could see my precious little boy had died at 16 weeks, at that moment my life had changed God showed me life is precious and children are a blessing from him. 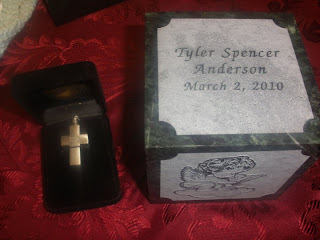 I was induced the next day March 2, 2010 and after 12 hours of labor with my husband and sister by my side I delivered Tyler Spencer, I was lucky enough to hold him and keep him with me until the next morning, I cannot explain the pain of the loss of a child. We had Tyler cremated so we could bring him home, I keep his urn and photo next to my bed so I can always remember the precious gift God sent me. Blessed be the God and Father of our Lord Jesus Christ, the Father of mercies and God of all comfort, who comforts us in all our tribulation, that we may be able to comfort those who are in any trouble with the comfort with which we ourselves are comforted by God.